The Polaroid Microphone features a highly sensitive electrets condenser directional microphone. 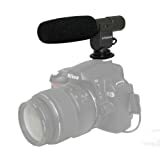 Being powered by a single three volt lithium battery (included), the microphone is capable of picking up even soft, low-level, high-sensitive sounds at relatively long distances from the camera or camcorder. It easily slides to your camera or camcorder via the shoe mount, brackets or video rig. The camera & camcorder need to have a microphone 3.5mm plug in jack. It connects to the camera with a single cord with a three conductor audio plug. The pickup pattern is super-cardioid. It is most sensitive to the target sounds in front of the microphone and very much less and eliminating any background sounds. Additionally , the microphone incorporates a combination on-off & angle selection switch (90 degree for a group of less than three & 120 degree for a larger group). It comes equipped with a battery level warning light. This entry was posted in Discount Photography and tagged Camcorders, Cameras, Condenser, Digital, Microphone, Polaroid, Shotgun, Video by Ball Photo. Bookmark the permalink.